What are the best seats in the Brighton Centre? 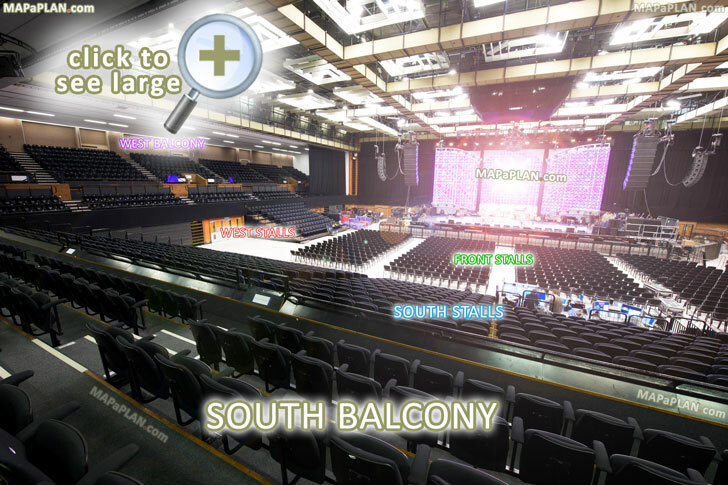 In the concert end-stage configuration the best seats in the Brighton Centre Auditorium 1 are the front rows in Front Stalls floor section. Floor rows are typically numbered A-U. Rows further back are OK however all floor seating is set on a flat floor so if a tall person is sitting (or standing) in front of you, the view may be slightly restricted (obstructed). Floor seats are numbered from 1 up to 49 from left to right. 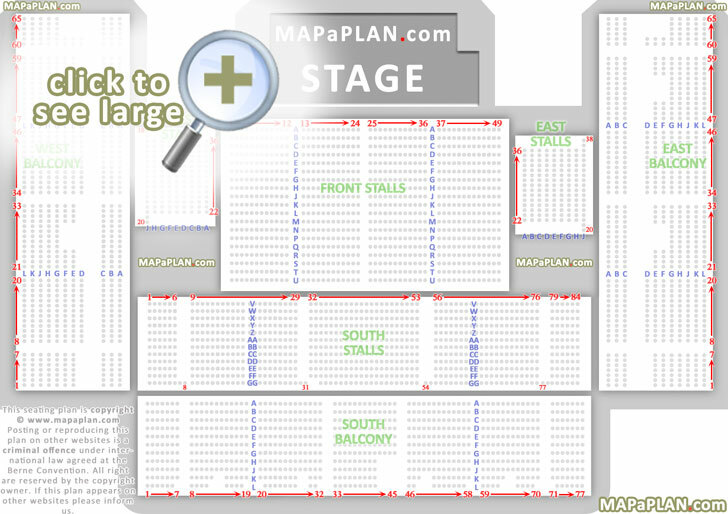 Check out the exact seating charts on this page to locate the seat numbers as close to the centre as possible for an optimum central view of the stage. For some shows the Stalls are removed and the entire floor section is general admission standing area. Surrounding the floor are the raised Stalls (West, East, South) and Balconies (West, East, South). These tiered seats are good as well, especially those in East and West Balcony. The seats in raised Stalls are located in rows A-J (West & East) and V-GG (South) and are numbered 20-38 (West & East) and 1-84 (South). The seats in Balconies are located in rows A-L (West, East, South) and are numbered 1-65 (West & East) and 1-77 (South). What are the names of the sections in the Brighton Centre? How are the rows numbered in the Brighton Centre? The rows in the flat floor seating blocks (Front Stalls) are lettered in alphabetical order from A up to U (A, B, C, D, E, F, G, H, J, K, L, M, N, P, Q, R, S, T, U). Please note that there is no row I or O. South Stalls have rows from V to GG (V, W, X, Y, Z, AA, BB, CC, DD, EE, FF, GG. West, East and South Balconies have rows from A to L.
What are some of the biggest acts that will be performing or have performed in the Brighton Centre?